It’s time for a new workstation! Since I started my YouTube channel, back in December of 2014, I’ve been using my work laptop for all of my editing and renderings. I got an upgraded laptop in September of 2015, which helped. However, rendering still takes a while, and editing was painful sometimes. When editing, the UI would stutter, and I would find myself waiting for it to catch up. I found that it was time to build a new workstation. There are two main benefits that building a new machine would provide for. First, it would allow for faster editing and rendering. A workstation with the latest hardware would be faster than my laptop. Even though I’ve got a killer laptop, a high-end graphics card would do wonders. Second, I could continue to work on my laptop while the video was rendering. On the laptop, I would have to wait until the video was done rendering to do anything. And the renders could be anywhere from 30-45 minutes. That’s a long time just to sit there and do nothing. A third, but minor, benefit would be that it would be a great gaming machine as well. Right now i just have my laptop and gaming is very sluggish on it. So, yay, a new gaming machine! Case: NZXT Noctis 450 Mid Tower ($140) – A sleek case with built-in red LED. It gets the job done. Cable management, in the Noctis 450, was pretty good also. It allowed me to punch the cables through dedicated slots, so they didn’t get all bunched up above the motherboard. It also has space on the top of the case for a water cooling unit, along with ports for tubes. Power Supply: CORSAIR RMx Series RM850X 850W ($120) – This is probably overkill for the machine. Most machines run pretty power efficient. However, I thought it would be good to have the extra headroom to let the power curve be better. Motherboard: ASUS X99-PRO/USB 3.1 LGA 2011-v3 ($333) – USB 3.1, support m.2 drives, and has eight memory slots supporting a total of 128GB of RAM! It is a monster motherboard. CPU: Intel Core i7-6900K 20M Broadwell-E 8-Core 3.2 GHz LGA 2011-v3 ($1100) – Sporting eight physical cores and a 20MB L3 Cache this is a great processor. There are probably faster CPUs for dedicated gaming, but the primary purpose for this machine is video editing and rendering. I also thought getting a Broadwell chip will put me at the edge and a little more future proof as it is the latest. CPU Cooler: Noctua NH-U12S 120x120x25 ($60) – I thought about going water cooled, but I went with this instead to stay within budget. It is doing the job just fine. It also fits in the case just fine with room to spare. It only came with one fan. If I do see a problem with the CPU temperature, I can get another fan, or just upgrade to the water cooling solution. Thermal Paste: Arctic Silver 5 ($7) – I’ve used this on every PC build I’ve done. The CPU fan came with thermal paste, but I’ve just always used this. It isn’t expensive. Memory: Ballistix Sport LT 64GB Kit ($250) – DDR4 2400 MT/s (PC4-19200). While the motherboard can support up to 128GB of RAM, I probably don’t need that. My laptop has 32GB of RAM, and I know I’m always bumping against that when rendering. Having 64GB seemed like the sweet spot. Harddrive #1: Samsung 950 PRO Series – 512GB PCIe NVMe – M.2 Internal SSD ($318) – This is my OS/Boot drive. It was a little tricky getting this to work right, but once I did, it is wonderful! This is a fast hard drive. There are tons of articles that talk about how this is the future of SSD. Drives plugging directly into the PCI bus removing the bottlenecks. I followed this video to get it going without disappearing on me. Harddrive #2: Samsung 850 EVO – 1TB SSD ($307) – This is my main data drive. Most of my work will be on this drive. It is big enough to hold my current work items and small enough not to be super expensive. Harddrive #3: Seagate 4TB Gaming SSHD(Solid State Hybrid Drive) SATA 6Gb/s 64MB Cache ($160) – A bigger drive for archiving and just raw storage. It isn’t as fast as a pure SSD drive but serves the purpose of storing data with a cheaper solution than a larger SSD. Graphics Card: MSI GeForce GTX 970 GAMING 4G ($290) – Not the top of the line, but still a great card. It is new enough that it supports everything I need and will make video rendering a much better experience. It will also do a great job with gaming. I also picked up some cables to make sure I had what I needed. The results are very positive for the new build. I can definitely see improvement in performance on both the editing and the rendering side. Editing within Premiere Pro and After Effects are very smooth now. No more stuttering or waiting for the UI to respond. Repositioning items before were very painful. Now it is very very smooth. I’m very happy about this! Here is the last video I rendered on my laptop. The length of the video was about 3 minutes. That took 27+ minutes. Here is what it took on the new workstation. The new build shaved off about 20 minutes of rendering time. That is GREAT! Also, I can continue to work on my laptop while the video renders on the new machine. The time back is really worth it. 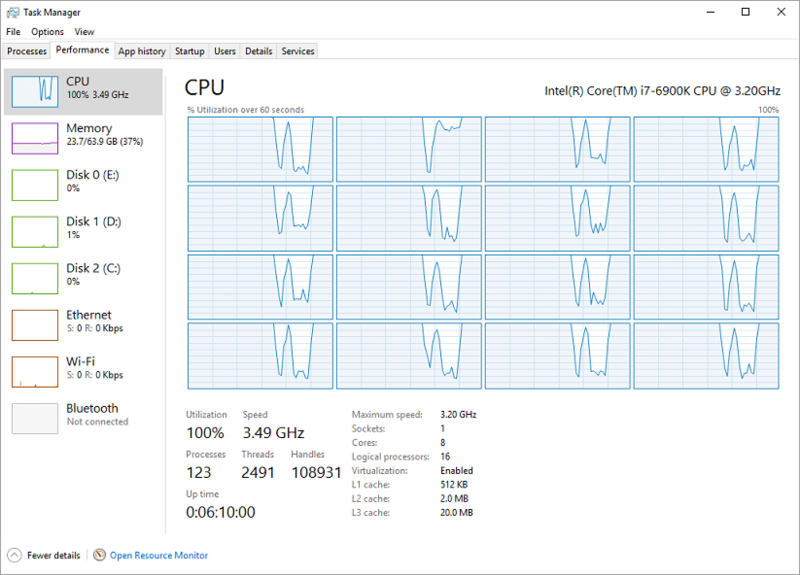 Here is a look at Task Manager while the video was rendering.